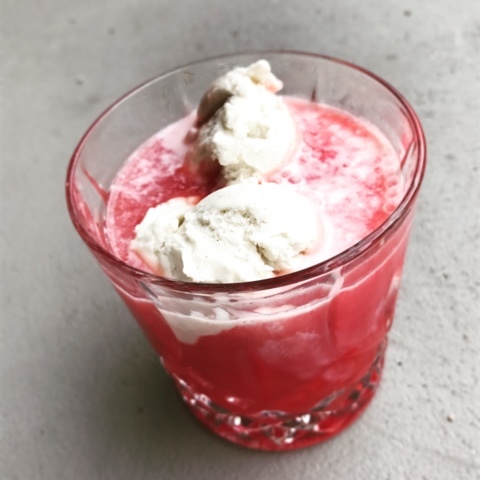 I love watermelon drinks, and this one is kind of the ultimate in awesome watermelon drinks. It starts with a super pink watermelon puree, sweetened with simple syrup. Then add seltzer to make homemade watermelon soda -- a perfectly delicious drink on its own. But to really take it over the top, vanilla ice cream turns the soda into a float. It's a great summer dessert -- pretty, sweet, and so delicious. Although I made this with vanilla ice cream, I bet lime sherbet would be really tasty too. 2. Cut up the watermelon into cubes. You should have around 8 cups, but you can pretty much eyeball it. Puree using a hand blender, regular blender, food processor - whatever you have handy. Strain through a fine-mesh strainer. You should have around 4 cups of juice, but again, it doesn't have to be exact. 3. Add the lime juice and about half the simple syrup. Taste, and add more lime juice or syrup to taste -- you want the concentrate to be pretty sweet and intensely flavored. 4. Chill the watermelon concentrate. When you're ready to serve, fill glasses a little more than half full. Top off with seltzer and scoops of vanilla ice cream. Serve right away!